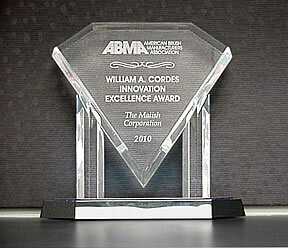 April 2010 – The Malish Corporation, a global leader in the design and manufacture of floor machine and surface cleaning brushes, has been awarded the ABMA (American Brush Manufacturers Association) 2010 William Cordes Innovation Excellence Award for its Diamabrush™ Floor Preparation System. The award is given to recognize outstanding innovation in the manufacture of products, components, or services in the Broom, Brush, Mop, and Roller Industry. The ABMA awarded The Malish Corporation for the innovative Diamabrush™ product, a revolutionary floor preparation tool used for concrete floor polishing, mastic removal, and hardwood prep. The award was presented to The Malish Corporation at the ABMA 93rd Annual Convention, which was held in Orlando, Florida at the Omni Orlando Resort at ChampionsGate. The Malish Corporation brings over 60 years of experience and expertise in the brush industry.